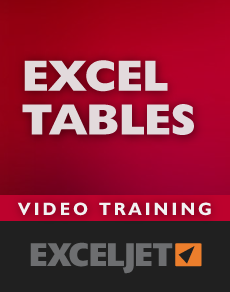 What is an Excel Table, and why would you want to use one? The short answer: Tables are a fantastic way to create dynamic ranges, and dynamic ranges allow you to write formulas that stay up to date when data changes. This is a killer feature for many business applications. Yes. There are some small differences in the Mac and Win interface with respect to tables, but in general this is one area in Excel where there is very good overlap between the Mac and Windows versions. The videos were recorded in Excel 2016 on Windows 10. All videos highlight shortcuts for both Windows and Mac. Of course! If you aren't happy with the course, just let us know within 30 days and we'll give you a full refund. This a no-quibble guarantee. We want you to be completely happy. We think people learn best with lots of examples and a no-nonsense approach that is quick, clean, and to the point. Less is more, and more is lazy. Contact us about special pricing for students, companies, or groups.